Smiling mischievously from behind his fake red beard, the young leprechaun shimmied up the traffic light, pausing every now and then to adjust his oversized green top hat and fluttering cape, as he claimed his perch high above the St. Patrick’s Day parade route. Below him on Dublin’s Lord Edward Street, the crowd decked out in Viking hats, tricolour wigs and painted faces remained oblivious to his presence as they waited patiently for the show to begin. Even the yellow-jacketed Gardaí failed to notice. Every year on March 17, Dublin is a city transformed. The sad dinginess of historic O’Connell Street, replete with gaming arcades and American fast food outlets, is restored momentarily to its former glory by the presence of tens of thousands of celebrants from around the world who all want to be ‘Irish for a day.’ Even the dank waters of the River Liffey, often derided by the locals as the River Sniffey, take on a festive tinge with the underbellies of its many bridges exposed with green lighting and the republic’s flag whipping at attention on dozens of poles lining the quay. Unlike Chicago, there is no green dye here. Nor, is there green beer. And a real Irish pub, not one of those touristy traps, will not imprint a shamrock in the head of your Guinness. The highlight of the day — the parade — is not the typical spectacle full of pomp and circumstance to celebrate a country’s national holiday. Instead, obvious displays of Irish pride are left to the spectators. Dubliners do it differently: think more travelling circus than pipe and drum bands and bland commercial floats. The purpose of the parade, the second largest St. Patrick’s Day celebration in the world, is to showcase the artistic abilities of the Irish by using the county’s leading pageant companies, young performers, costume designers, and musicians. It’s a relatively recent invention, dating back to just 1996, that owes its existence to the influence of the powerful Irish diaspora and its parades in the Big Apple and Chicago. 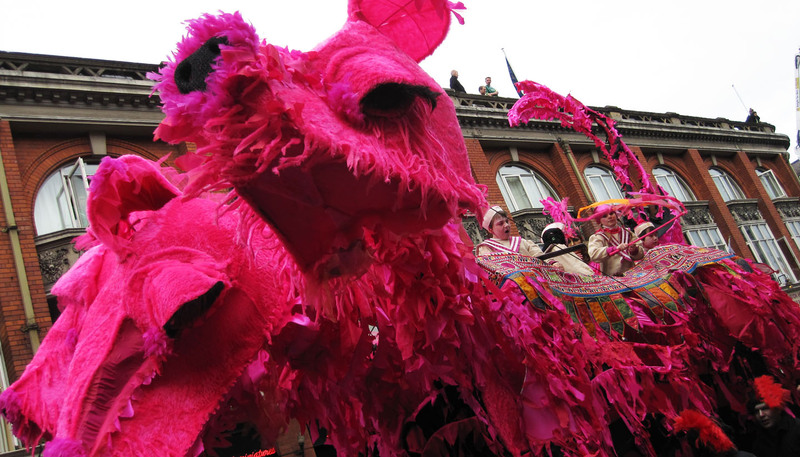 In Dublin, the parade is part of a four-day festival, running from March 16-19, which includes live music, street theatre, film, and races. Each year, the parade is built around a theme. In 2011, it was famed Irish novelist Roddy Doyle’s short story Brilliant, which explored the collapse of the Celtic Tiger in the worldwide recession of 2008 and the humiliating €67.5-billion ($89.9-billion) Irish bailout two years later by the International Monetary Fund and the European Union. In Doyle’s short story, two children lead a pied piper-like charge through the streets of Dublin, enlisting the support of a friendly vampire along the way, to banish the “black dog of depression” over Dublin to bring the city’s laughter back. This year, parade organizers have gone in a totally different direction — science. Using specially crafted contraptions and brilliantly coloured costumes, performers will animate and explore the questions children often ask their bewildered parents about the world. Questions such as: Why do we dream? How is a rainbow formed? What lives beneath the sea? How is electricity made? And, if the Earth is spinning, why don’t we fall off? The focus on science weaves in nicely with the country’s desperate attempts to keep its reputation as a global high-tech hotspot, gained during the tiger’s boom years when Ireland attracted a number of big companies, such as Google, Microsoft, Dell, and Intel to its shores with low tax rates and easy access to the European Union market. Several of the companies remain in operation but high unemployment, higher taxes, an uncertain economy in Europe, and a flood of young people and skilled workers fleeing for greener pastures have eroded many of the benefits of staying. Last year, my friend Alicia came to Ireland to visit me while I was studying at University College Dublin. Like 550,000 other people, we decided to trek into the city’s core to take in the parade and join in the party. We failed to heed the advice of the parade organizers and started off our morning late, exhausted from a late return from Cork the night before. Packed double-decker buses filled with partygoers made the delay even longer. We smartly decided against trying to find our way through the crowds to O’Connell Street and instead settled, like the leprechaun, on Lord Edward Street where we secured a great spot near Dublin Castle and Temple Bar. (If you are running late, try for a spot like us further down the 2.5-kilometre parade route like Dame Street or Patrick Street). We even had time along the way to get our cheeks painted with shamrocks on Grafton Street for a few Euros each and then amble down the cobblestoned streets taking in the sights along the way. For those who can’t stand for hours on end, there is the option of paying €60 for grandstand seating. The tickets, which can be purchased online from the St. Patrick’s Festival, guarantee dedicated seats, vantage viewing, live parade commentary, and toilet facilities. It’s a steep price to pay when it’s free viewing on the street, especially for international visitors dealing with an unfriendly exchange rate. It’s money after all that could be better spent at the pub afterwards, especially when pints of Guinness start around €4.50. People watching is the best way to while away the time until the parade shows up. The getups are really something — like the entire contents of Carroll’s Gifts & Souvenirs’ has been thrown into the air and landed with no rhyme or reason on the good natured crowd. There is the woman wearing the super tacky Póg ma thoin (kiss my arse) boxer shorts standing on a stepladder, an older gentleman lighting his cigar dangerously close to his flammable green wig (made in China) and a Muslim woman wearing a pair of springy shamrocks from a headband resting on top of her headscarf. A sea of green greets the eye everywhere. The parade itself is a surprise, filled with bizarre moments and jaw-dropping spectacle. You never know what will emerge around a corner. In less than two hours, we spotted quizzical wolves dressed in nightgowns and caps, human giraffes, Napoleon driving a lawnmower while towing a giant boot, a three-headed flamingo, a flaming phoenix, a black knight and his trusty stead, and a dragon. And of course, the black dog made an appearance as he was chased away by the children. The floats are a tangle of beautifully welded contraptions holding giant papier mache puppets that are driven by farm equipment, powered by bicycles or pushed along by costumed helpers. The choreography of the dancers is simple. A crowd favourite was the flying pig. The size of a small car, the porcine apparition could reach out into the audience and peer down upon spectators. The pig operated like a sliding movie camera with a man working levers on a separate platform from behind to raise and lower it. Like most of the creatures featured in the parade, I couldn’t tell you how it fit in with Doyle’s story but it sure was fun to watch. Quick as a wink after the last performer had sashayed down the street followed by a group of cyclists; the leprechaun shimmied down from his perch and magically melted into the crowd. 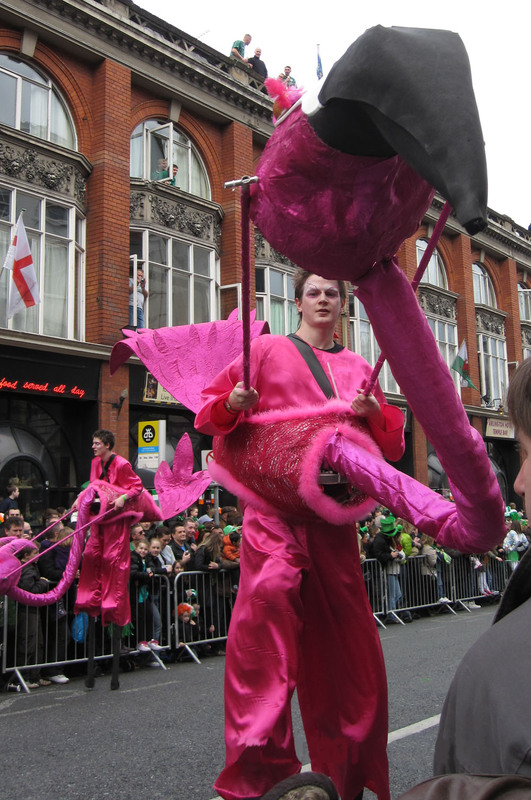 The only person — other than me — that had seemed to see him was one of the stilt walkers in a giant flamingo suit. Perhaps, he headed back to the Leprechaun Museum just down the street . . .
Like clockwork every year after the parade thousands of thirsty spectators swarm into Temple Bar’s pubs and restaurants. It’s hard to believe only four decades ago Dublin was a dry town on St. Patrick’s Day and there was no parade on the bank holiday. According to bestselling Irish novelist Maeve Binchy, Dubliners who fancied a drink on the big day were forced to imbibe at home or travel to the city’s dog show, which for some reason had a liquor licence. I can’t imagine wanting a drink so bad I’d attend a kennel club show! The secret to securing a spot in a Dublin pub on St. Patrick’s Day — other than luck — is breaking a large group into several smaller ones stationed at different areas along the parade route. Whoever scores the best seating texts the location by cellphone. That’s how Alicia and I wound up in a nice wooden snug on the second floor of Messrs Maguire’s pub with 10 of my Irish university buddies. Friends who had made it into town sooner had watched the parade on O’Connell Street just a stone’s throw away from Maguire’s. The place was jumping with live music and the pints were flowing. Quite possibly the best things about a serious pub in Ireland are: the bartenders don’t give you attitude (unless you’re wasting their time), they take pride in a perfect pour and you never have to tip. If you can’t stomach the delicious darkness of Guinness, ask the bartender to add some blackcurrant juice to it, or try a local craft brew. Dublin’s city centre is compact enough that it’s a great city to pub crawl in, especially on the twisting cobblestoned streets of the Temple Bar district. Keep in mind: Temple Bar is both a bar and an area filled with bars. The likelihood of getting into the bar Temple Bar on St. Patrick’s Day will require waiting in a long line-up. But there are plenty of other good spots nearby, including The Porterhouse (the city’s first pub brewery), Purty Kitchen, Oliver St. John Gogarty, and the Czech Inn. Most of the pubs serve traditional Irish fare but if you want something lighter and faster, try a burrito at Pablo Picante (students get a discount!) or a kebab at one of the street vendors. For those looking to explore outside Temple Bar and cross unusual and historical places off their lists, try the Dawson Lounge at 25 Dawson St. It lives up to its name as the smallest pub in Dublin — think slightly larger than a broom closet and a phone booth, or your aunt’s tiny sitting room. For the historical, there’s the Brazen Head — the city’s oldest pub, which dates back to 1198. Located off to the side of a steep hill on Bridge Street, the Brazen Head is not the cheapest place to buy a pint in Dublin but it certainly has atmosphere. As the hours pass, the streets will become even more crowded and the revellers more inebriated. Dublin is a relatively safe city but care should be taken to travel together with friends. It’s easy to get lost in the crowd so try and know ahead of time where your group is meeting up. Bank machines are often located outside on the street in Dublin and line-ups are even longer than usual on St. Patrick’s Day. If the idea of punching in your PIN among a group of drunk strangers makes you nervous, be sure to plan ahead and have cash in hand. The cheapest and safest way to get home after a night of St. Patrick’s Day fun is by Dublin Bus. Short distance fares start at €1.40 and there are a number of stops close by the Temple Bar and Grafton Street shopping areas. There is also a late night bus service called Nitelink, which operates after the regular buses shut down. It costs €5 and operates Friday/Saturday morning and Saturday/Sunday mornings only.